Like it’s said, “A picture speaks more than a thousand words”, similarly infographic does the same. Infographic is a visual representation of statistical data, information and knowledge. It displays complex and lengthy information in a pictorial and engaging form that captures the eye and conveys information clearly and quickly at a glance. Infographic is highly effective for delivering bulk of information in a concise manner. This tool helps with both organizational internal communication and external communication with your target audience. Majority of businesses with impactful online presence market their product/services to their target audience through infographic tools to create a strong visual impact and deliver information about their offerings in the fastest and shortest possible time. With infographic, companies convey their message and company offerings in an engaging way that helps convert potential customers into sales. If you also wish to maximize your ROI and increase web traffic conversion rate then try incorporating infographic display. You can use web-based tools by yourself to create infographic of your company’s information or you can hire a designer who has the art and expertise in creating such designs in the most effective and engaging way. As people don’t have time to read big paragraphs of information on your website, infographic diagrams, pictures and graphs are a good way to summarize this information in a quick and concise style. So, if you are aiming to market your product and services through infographic then first you need to create compelling and interesting content that will grab the attention of your audience right away. To support the content and information you have, try to add statistical data too. Statistical data adds more weight and credibility to your information. It will help market and promote your offerings in the most effective way. You can collect data from credible research companies like Pew Internet and illustrate that data in your infographic. Also, if you have taken help from different sources for data collection, you can ask them to help promote your resulting data and infographic. This will increase authenticity of your infographic and make it more reliable. Once you have the relevant information and statistical data, now it’s time to create eye-catching and alluring infographic and data visualization design. If you don’t want to hire a designer, you can create infographic designs by yourself with infographic tools. This is a web-based tool that offers six free themes to create simple and effective visuals. They also offer a comprehensive array of themes for the paid version. With this tool, you can drag and drop a variety of shapes and insert interesting images too and enjoy customizing. Also, you can add data in graphical form like line, pie and bar charts. The option to export to different formats like PNG and JPG is also available. This tool is simple, easy to use and available for free. These tools can be integrated with social media networks with ease. And you can analyze Facebook and Twitter data with your team of employees. This will help you identify and analyze response of fans, your progress as a company and devise new strategies to improve and attract more fans. In order to you use this software; you need to download it because it is not web based. Once you download it, you can create a wide variety of interesting and interactive charts for data visualization like Venn diagrams, line graphs, bar charts and heat maps. This tool can also be used for creating infographic display. This tool is highly effective for conceptual visualizations and also for storytelling. It offers a user friendly interface and colorful themes. With this tool, you can insert maps, graphs and comparison/relationship charts too. It offers a large variety of well-designed and engaging objects that help communicate your idea in the best possible way. Infogr.am is also a web-based tool that you can use for free. This tool offers a wide range of themes and has a user-friendly interface. This tool enables you to create infographic and charts by inserting real data. It offers about 31 chart design options including scatter charts, bubble charts and radial bar graphs for fantastic data visualization. You can use these charts on your website and display valuable facts about your company more clearly. What good is the infographic if nobody sees it? Therefore, after the creation of infographics and data visualization designs, you need to promote it actively. Blogging is an effective way to promote infographics. You can create blog posts to support your infographic. You can promote your blog posts supporting infographics through your blog’s social media channels like Flickr, Facebook and book marking sites and add back links to your main page hosting the complete infographic. 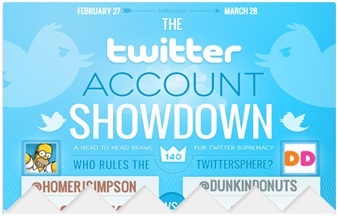 You can schedule tweets relevant to your infographic with a link back to the complete infographic. Another way to promote your infographic is by submitting it through aggregators and also through directories. Here is a list of directories you can use to market your company with infographic. Another way to market with infographic is to create screencast videos and viral it on video hosting web pages like YouTube. You can create visuals through tools like Present.me. This tool enables you to create interesting presentations and record yourself talking and delivering information about the slide being displayed. It’s a good way to attract customers and clients and share a proposal. Also, you can share your data visualization and infographic design with people who are influential users on social media pages and book marking sites like Digg and StumbleUpon. These are some of the best practices on marketing with infographics that companies use across industries to engage and attract their target audience to their websites.